One of my thrifty obsessions is to walk through the local Goodwill shop on the weekends, particularly because of the half off sale. Throughout the day, they announce a color and the price tags labeled in that color are half off. It never fails, each time the make the announcement they assure you that you will find that color label in every department. Naturally, you will always find me by the home goods and furniture section. 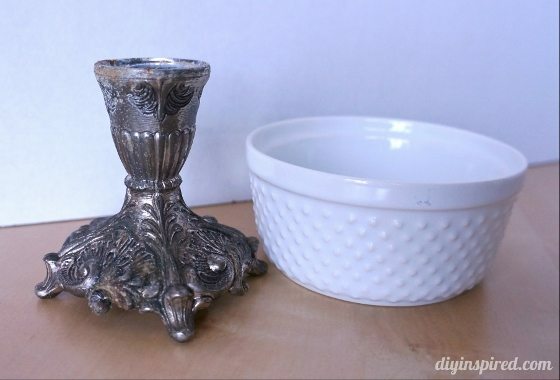 This trip I found a nice white ceramic beaded ramekin and a short pewter candlestick all for less than three dollars. I had to marry the two together and make a DIY Pedestal Bowl. I’ve made something similar to this for my daughter’s birthday party last year. For her cupcake decorating station, I made party platters made out of plastic serving trays and candlesticks. I still have them today and have used them several times since then. This project is quite simple and doesn’t really need too much explanation, so here are just a few tips that may help you out. Tip #1: When looking for candlesticks, look for the shape you want. You can always paint them. Tip #2: The wider the candlestick the sturdier. Tip #3: Consider wine glasses or champagne flutes instead of candlesticks. Tip #4: Use a strong bonding agent like E6000 and let it dry for 24-48 hours. 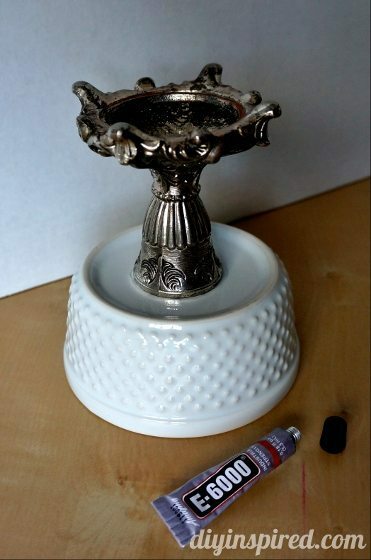 Tip #5: Consider spray painting them to fit your theme or décor. Protect the surface with a doily or decorative paper if you are using it for food. There are several uses for this easy project. Use them for displaying desserts or appetizers for parties and entertaining. 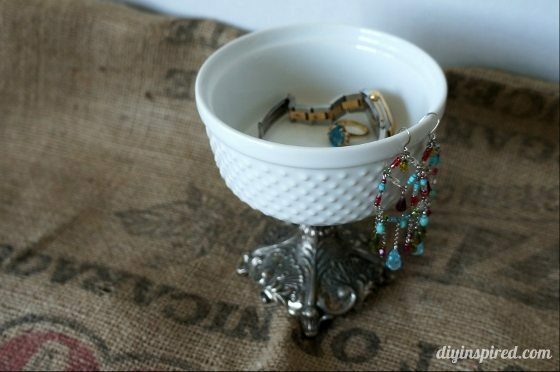 Use a small pedestal bowl for jewelry or a larger one to hold toiletries in your bathroom. You can also use them to display flowers or favorite collections. Make several in different heights and group them together for a unique display. This is a great idea. If you can find 3 or four candlesticks, you can use them as “feet” on a large basin or bowl.